TV with Thinus: Discovery revives its shuttered Real Time channel brand for Africa, added to MultiChoice's DStv and StarTimes and StarSat. Discovery revives its shuttered Real Time channel brand for Africa, added to MultiChoice's DStv and StarTimes and StarSat. Discovery has revived its Real Time channel brand it shuttered in 2010 with the lifestyle channel that is being added to both MultiChoice's DStv as well as China's StarTimes in Africa and StarSat in South Africa as part of channel carriage agreements. The logo above is Real Time's logo at launch in Africa, slightly different than the logo (right) of when Real Time was shuttered in 2013 where it ran as a channel in the United Kingdom and parts of Europe. The teal and coral colours have been switched, the coral changed to red, and the word "Discovery" dropped from the logo. "We are incredibly excited to present Real Time to the market, and further expand and diversify our local portfolio offering," says Amanda Turnbull, vice president and general manager for Discovery Networks in Africa and the Middle East in a statement. "With an already successful suite of pay-TV brands, Real Time affords us the chance to bring our world-class content to even more audiences across South Africa, in the form of a channel designed to provide much-needed ‘me time’ to the modern African woman and her wider family." "With so much in store for our viewers and commercial partners, we look forward to establishing Real Time as Africa's newest go-to destination for quality female-skewed programming," says Amanda Turnbull. On MultiChoice Real Time is the supposed "replacement" channel for the dropped Animal Planet at the end of 2017, although not really. While Animal Planet was aimed at higher pay-TV subscriber tiers, Real Time that was added on Monday 3 September is "tailored specifically" for DStv EasyView subscribers - the cheapest package. What that means is that Real Time will probably irritate (or be ignored by) a lot of existing DStv subscribers since it will likely be packed full of repeats - programming that DStv subscribers have already seen on other Discovery channels. Discovery literally chose to highlight People Magazine Investigates that will be on Real Time and that is literally currently showing on ID" Investigation Discovery - which just serves to underscore the already-kinda-rerun fatigue world Real Time will inhabit. Also strange is that MultiChoice would take away something like Animal Planet that was somewhat distinct, and replace it with something like Real Time that as a "female-skewed" channel, will be competition for the existing TLC (DStv 135) that is also from the same Discovery stable. Why make additional competition for yourself? Discovery says Real Time is a "general entertainment channel for female audiences" and will be "bringing the best of Discovery's lifestyle and factual storytelling to a whole new fan base" on channel 155. Does this mean that the "best of Discovery's lifestyle and factual storytelling" is no longer on TLC? 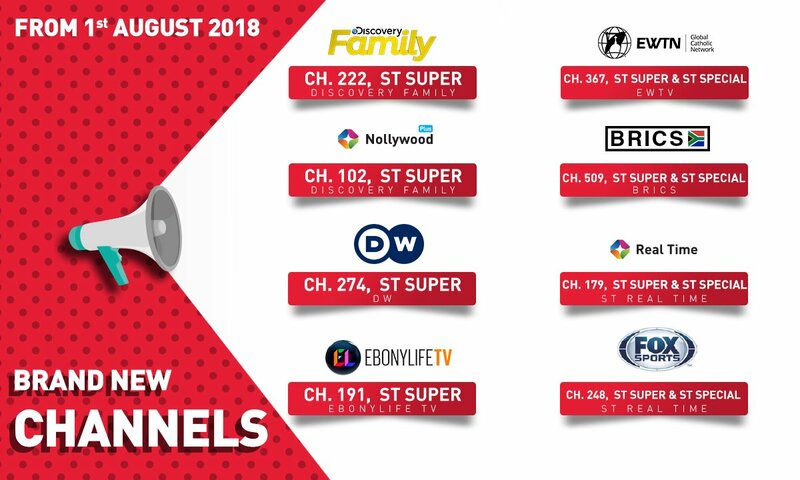 How are the two channels different, while Discovery Family is also lurking as the third triplet in the closely related channel grouping? 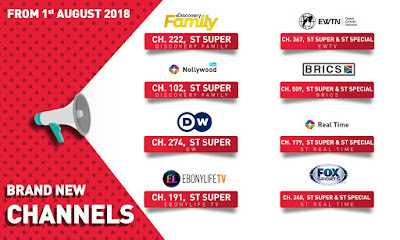 Also on MultiChoice, besides Real Time's linear offering, a selection of Real Time's programming will also be available to stream or download on the DStv Now platform. Real Time is also being added to China's StarTimes across Africa, as well as in South Africa to StarTimes Media SA and On Digital Media's (ODM) StarSat. This is part of a new carriage agreement signed between StarTimes and Discovery Networks that had that public show-and-tell channel deal signing ceremony in August in Beijing, China. StarTimes and Discovery switched out Discovery Science for the bland more mass-market Discovery Family, and is adding Real Time. Several things to note here: On StarTimes Real Time becomes competition for Discovery's own TLC on DStv. Secondly, StarTimes and StarSat blatantly lied when it released the Real Time channel logo to make it look as if it's a channel packaged for StarTimes and StarSat as one of StarTimes' own channels, under its own logo. StarTimes and StarSat literally marketed Real Time as the "StarTimes Real Time" and "ST Real Time" channel on channel number 179. This is however not the case - Real Time is packaged and distributed by Discovery Networks and doesn't carry any StarTimes channel logo as part of its real design and as StarTimes pretended. Questions in previous weeks to gain clarity on this embarrassing gaffe, what went on here, and why Real Time was initially shown with this logo, have been ignored and went unanswered. Thirdly, Real Time on StarTimes and StarSat isn't on this pay-TV service seen as a "cheapo" addition. Real Time on StarTimes and StarSat is only available to the two most expensive packages, Super and Special. It's weird how the inherent channel value proposition can sometimes be so arbitrarily defined or interpreted. It's the exact same channel, with the same channel logo and branding. Yet only those paying the most will be able to get Real Time on StarSat, while those paying the least and everybody else will get Real Time on DStv. After waiting 8 months for the Animal Planet replacement and wondering what channel it would/could be, Real Time is, sorry to say, a real disappointment-addition. Why this sort of retread channel for South African and African audiences when TLC and Discovery Family already exist? It feels like way too much duplication, like McDonalds adding yet another Big Mac version when the customer already has too many choices with/in one product line. And why is Africa getting a UK/Europe reject channel? And again in a market where TLC already exists? It's a bit weird that Amanda Turnbull would actually say Discovery Networks is "incredibly excited to present Real Time to the market" since nothing about Real Time really looks incredibly exciting. I really thought and expected something more "wow-ier" from MultiChoice and Discovery - something that South African pay-TV subscribers haven't seen or experienced before, like maybe Velocity (soon to rebrand as Motor Trend Network) as a cool 1080p HD channel, or maybe DIY Network, or something like that. But it's not to be.